It surfaced at Valley Street (see the above picture) and as a river it flowed through Irvington, Union (through the property of Tucson Dairy), Hillside, Elizabeth, Arthur Kill, Raritan Bay to the Atlantic Ocean. Over the years this river had more than its share of tragedies, runaways and bored teenagers. To the best of my memory we had three airplane crashes in the early 1950's. They occurred within a period of a couple of months. I forget how many people were killed. All of them were airliners taking off from Newark Airport. I believe they were caused by mechanical failures. The FAA closed the Newark Airport for a period of time to try and determine the source of the mechanical failures. At the time of the failures the pilots frantically sought a place to land over a densely populated area. One or possibly two of the planes crashed into the Elizabeth River. Back in the early 50's a live dairy cow was found stranded in the river at Valley Street. At that point the river went upstream through 5' underground sewer pipes. There were two big questions - where did she come from and how do get get her out? The former was answered from the owners of Tucson Dairy. I believe the latter was solved by walking the cow on a reverse journey to Tucson Dairy in Union, which sat right on the Elizabeth River. I was one of around 20 young teenagers that hung out at Pat's Deli on the corner of Silver Street and Sandford Avenue in the early 50's. In the evening if the police car chased us off the corner we would take off. Sometimes we would take the 94 Stuyvesant Avenue Bus to Saint Georges Avenue in Roselle or Brick Church In East Orange for a nickel. Other times we would walk along the banks of the river. The walk along the river was very interesting because it brought us through a cemetery in Irvington and eventually to Route #22 in Union. 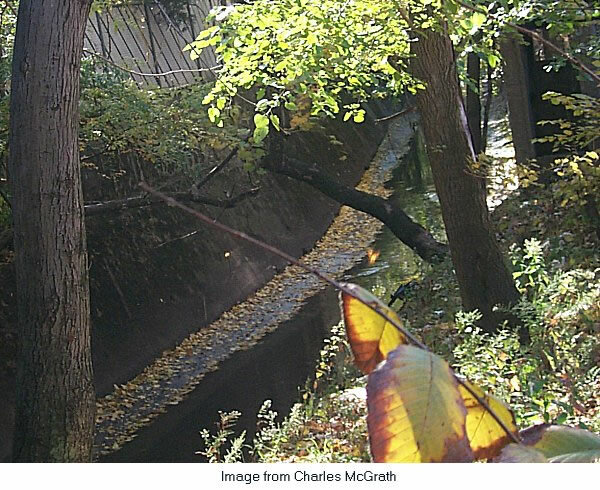 Braver souls would take the northern route of the trunk sewer at Valley Street. This route brought them under the streets of Vailsburg. Periodically they would lift a sewer plate (at the risk of being run over) to see where they were located. In my case claustrophobia prevented stupidity from ruling the day. Driver licenses soon put all of that to sleep and we said good bye to the Elizabeth River.